My earlier posting, “New Sidewalk, Short on Common Sense and Oversight, a Disaster for Pedestrians“, about the new sidewalk in front of Wunderbar brought a number of comments and some interesting dialogue about what is really going on with sidewalks in Hudson. As wunderbar commented about that posting, “Stay your gavel and break out your ruler”. In fact, this sidewalk was built to the city’s code requirements. With Carole Osterink pointing me the way to the applicable city codes (Chapter A330. CURB, SIDEWALK AND STREET REQUIREMENTS and Chapter 266. STREETS AND SIDEWALKS) where the requirements are spelled out in considerable detail, I now see a bit deeper into this problem. BTW – Carole has a different take on sidewalks in a recent posting, “Where the Sidewalk Ends”. Her words speak one story, the photos seem uniformly to support the assertion that our sidewalks are a hazardous mess. The city has ordinances that are not being enforced. And, based on the evidence of a new sidewalk just up the block from the Wunderbar sidewalk as you turn the corner onto Prospect Ave., not being administered with consistency. The code calls for the width of a sidewalk to be 5 feet. 44 inches is a bit shy. 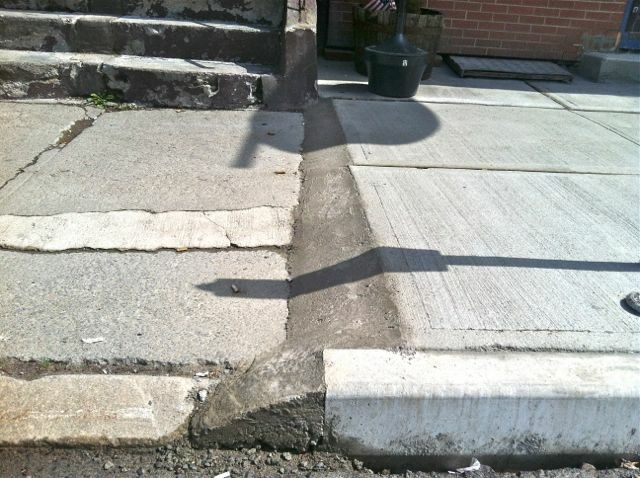 It seems that perhaps the deeper issue revolves around a reluctance by the city to enforce its own codes to get property owners to rebuild sidewalks. In some places, like lower Allen St. near Front St., the sidewalk has simply disappeared. We need an injection of pride of place. Hudson is such a compact walkable place, with many charms. But, one hesitates to walk almost anywhere without gazing fixedly downward for fear of treachery by sidewalk. Clearly this problem cannot be solved without some action by the elected officialsThis might include developing a multi-year city wide project and perhaps the city asking for bids from contractors for large volume sidewalk construction so that the cost of the construction can be driven down. This could also facilitate whole blocks being rebuilt at once so that the finished product is a flat, safe surface for pedestrians. Another area of enforcement that would appear to be flagging is the attention to the details spelled out in the ordinances for the materials and tamping of subsoils before concrete is poured. 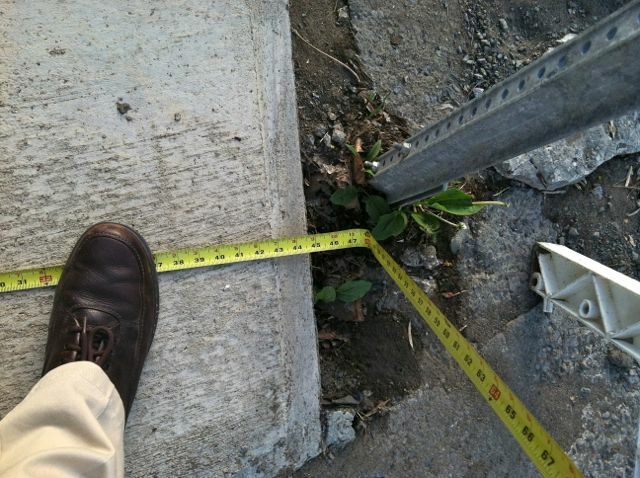 Everywhere in the city there are examples of subsidence of the sidewalk relative to the curbing of one and more inches. This can only be the result of poor construction techniques. Finally, wheelchair ramps. Laws, regulations, and general social consent that disabled people should have fair access to social spaces have been in place for decades. Somehow, our sidewalks are exempt. There are innumerable intersections where there are no curb ramps. As part of a rebuilding of sidewalks we should put these ramps into place. I do still stand by my comments that the sidewalk constructed in front of Wunderbar defies common sense. Practical people solve problems in a way that is workable and durable. This abrupt transition between the two sidewalks is not workable nor safe. The city code enforcement and the contractor should have come up with a solution that resolved this. Lacking some vigorous action by city officials or the shame of the owner of the building adjacent, this sidewalk mess will be with us for years (decades?). Articles in The Gossips of Rivertown and Register Star about the marking of fresh concrete sidewalks in front of WunderBar and the forthcoming The Crimson Sparrow with graffiti inspired considerable comment. 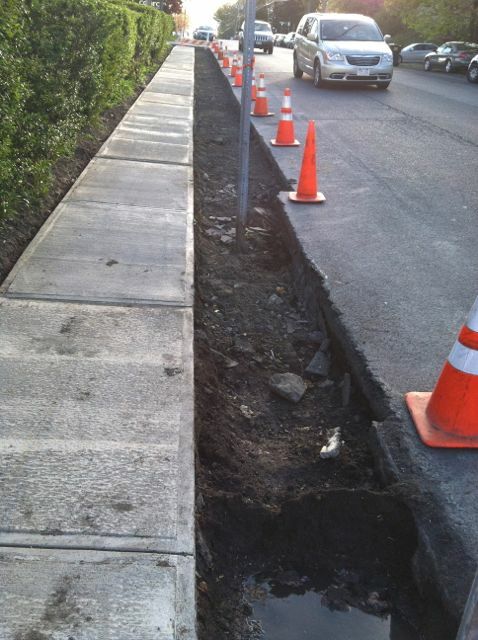 A recent walk up the street revealed a problem with this sidewalk work that can not be eradicated with a trowel. There is a mismatch in elevation of roughly three inches as you walk up Warren and another at the end of the new section of an inch or more, an obvious hazard to pedestrians, an insurmountable barrier to wheelchairs. Common sense dictates that sidewalks be flat, regular surfaces without such hazards. Doubtless design standards for sidewalks say more. What does this say about the owners of these buildings? What does it say about the workmanship of the contractor, a local one at that, to build something like this? And, where is the oversight of the city? Can one simple jack hammer a sidewalk and put down anything you want? By way of prediction, this ramp of concrete that the contractor put it to mask this travesty will not survive more than a winter of two before it begins to disintegrate. Good old mother nature, here through the freeze-thaw cycles of our winters, will reduce this to rubble.